This recipe I got from one of my aunts 'Teta Anka'. Growing up she would make these all the time, our entire family loved them-and there is a lot of us. These biscuits are the ones where if you try one you just can't stop eating them, you have to have more, they are so addictive, no one can ever stop at one. When I got married I asked for the recipe and she gave it to me, and since then I make them all the time. My kids love them, I love them, all my guests love them also. 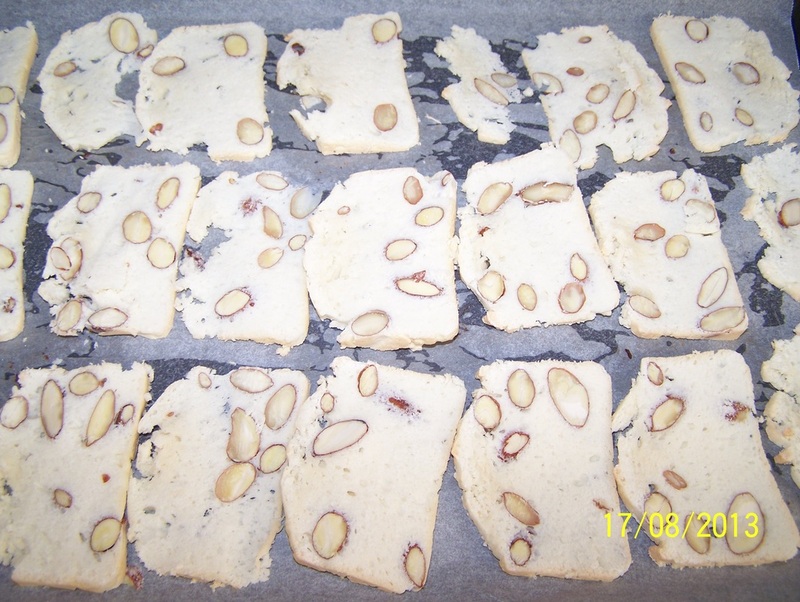 I had previously posted this recipe on my personal Facebook page, and one of my friends had made almond bread. I remember commenting that I make those, and the reply was 'thank Teta Anka for the recipe'. As the recipe uses only egg whites my tip for using up the egg yolks is to make up a custard. My Portuguese custard tarts are a great way to use up the yolks. If you don't feel like making the Portuguese custard tarts, simply make the custard as per recipe as it is delicious and fill shop bought pastry cases with the cooled custard, top with fruit, easy simple dessert. Preheat oven to 180C/160C fan forced. Grease and line with baking paper a 25cm x 8cm bar tin. Beat egg whites until soft peaks form. Add the caster sugar gradually-a tablespoon at a time into the egg white, beating well after each addition. 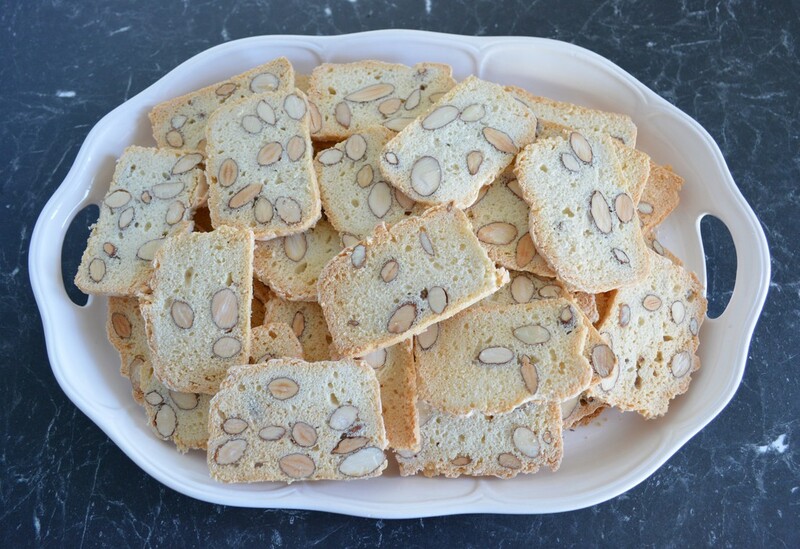 Fold in the flour and the almonds. Spread into your prepared bar tin. Bake for 30 to 35 minutes or until just firm to touch. 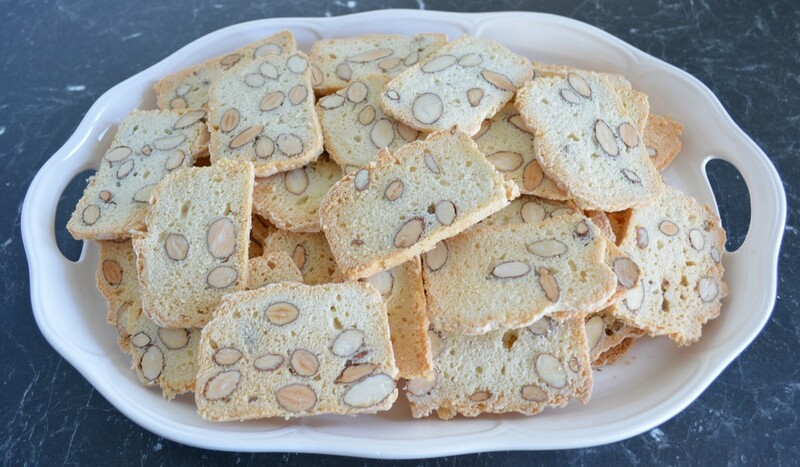 Using a very sharp knife or a bread knife, cut the almond bread into wafer thin slices. Place the slices on a baking paper lined baking tray, bake in a slow 160C/140C fan forced oven for 20 minutes or until dry and crisp.